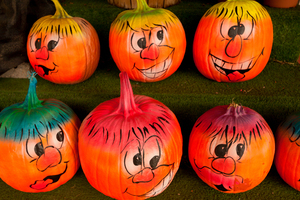 Kids love making Thanksgiving pumpkin crafts too, not just pumpkin crafts at Halloween. Thanksgiving is a time when gourds, squash and the ever-wonderful pumpkin find their way onto the Thanksgiving table in one way or another. One of the more common but loveable crafts kids like to do with pumpkins is make things. Of course at Thanksgiving, what could be more popular than a "turkey" made from a pumpkin? With two very popular items at Thanksgiving, turkeys and pumpkins, why not combine the two in some fun way? All you have to do, is poke holes into the back of the pumpkin and stick in something for the feathers. You can use suckers, large lollipops, or brown and black pieces of construction paper cut into feather-like shapes. Glue those onto popsicle sticks and arrange them like a fan across the back of the pumpkin. Construction paper can be used to make a face, or simply draw it on with a black magic marker. Oval-shaped pieces of thin wood work well too. If you are handy with a jig-saw, draw these out, cut and let the kids paint them. Pegs can be pushed into the bottom of the feathers, and then pushed into the pumpkin to hold them there. Pumpkin pie is a favorite at Thanksgiving and if you make the real thing at your house, you will have a hollowed out pumpkin shell. No need at all to waste this. Kids love pumpkin crafts for making funny faces on at Thanksgiving too. Not only can they draw funny faces, they can cut out faces too. Not all pumpkin faces are scary like jack-o-lanterns. Cut out or draw a happier looking face instead. Once the shell is finished but not cut, it can sit on your table full of dip, buns, fruits, a vegetable, whatever you like. Line the inside first if using it in this manner with some saran wrap or waxed paper. If it's been cut, it can sit with nothing in it except for a tea-light to create a lovely glow for the table. These simple Thanksgiving pumpkin crafts that kids like to make can really add to the decoration of your table. They make great centerpieces, the family has had fun creating them and even after dinner, have the kids make a birdfeeder out of them to hang outside.